If you're envious of Boston's incredible professional sports success, don't come to Fenway Park next Tuesday. That's the Red Sox's 2019 home opener against the Toronto Blue Jays, and as is tradition, they'll celebrate their 2018 World Series title in a pregame ring ceremony. But they won't be alone: Members of the 2018 New England Patriots, who just won Super Bowl LIII in February, also will make an appearance to be recognized for their sixth championship. Red Sox president and CEO Sam Kennedy confirmed Thursday the Patriots have accepted the team's invitation. "We're ecstatic that they're going to be there," Kennedy added. Tuesday will mark the Red Sox's first official double booking of title celebrations, even if this scenario has happened before: A few members of the Super Bowl champion Patriots came to Fenway for Boston's 2005 home opener, but the main stage belonged to the 2004 World Series champion Red Sox. 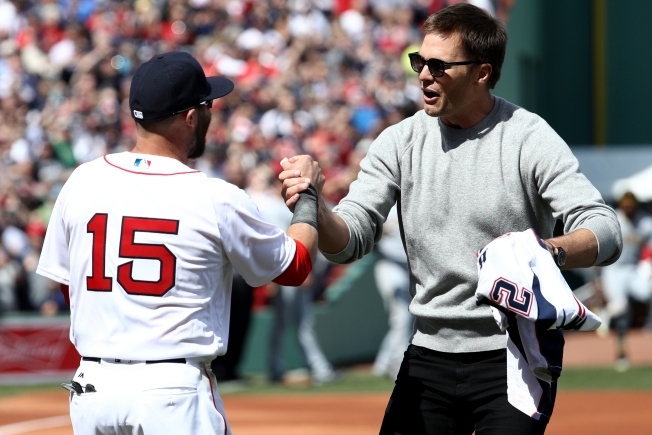 It's unclear who on the Patriots will attend, but the guest list could produce some interesting storylines: Will Rob Gronkowski make a post-retirement appearance (and will quarterback Tom Brady tackle him in the infield again)? Will Patriots owner Robert Kraft show his face amid an ongoing legal battle over solicitation of prostitution charges -- that includes a filing against Kraft by The Boston Globe, which is owned by Red Sox principal owner John Henry? There's intrigue on the Red Sox's front, too: The team has invited ex-closer and current free agent Craig Kimbrel to the ceremony, but he had yet to accept or decline as of Thursday. Kennedy also suggested players from past Red Sox World Series champion teams -- they also won in 2004, 2007 and 2013 -- may join the Fenway festivities, setting up what will be a historic afternoon of celebrating excellence in Boston.